For the most recent report of the Intergovernmental Panel on Climate Change (IPCC), fifteen climate modelling groups from around the world were asked to provide simulation outputs from their state-of-the-art carbon cycle models. The objective of these experiments was to provide up-to-date estimates of what happens to anthropogenic CO2 emissions, how they will be apportioned between atmosphere, ocean and vegetation, how long they will stay in the atmosphere and what are the long-term climate change implications. Researchers in the Palaeoenvironmental Change group were one of the contributing groups, providing results from more than 50 different experiments using the Earth system model GENIE. Strict protocols were defined for all of these experiments that every group had to adhere to. These protocols defined precisely how the experiments should be set up, an important element of all model inter-comparison projects as comparing the results of “identical” simulations from many different models helps to identify and quantify areas of uncertainty in our understanding. The results of these experiments were an important component of the IPCC AR5 report. They were also published as three separate scientific papers, examining separately the recent historical period, projections into the future and a specific study to quantify the atmospheric lifetime of anthropogenic CO2 emissions. 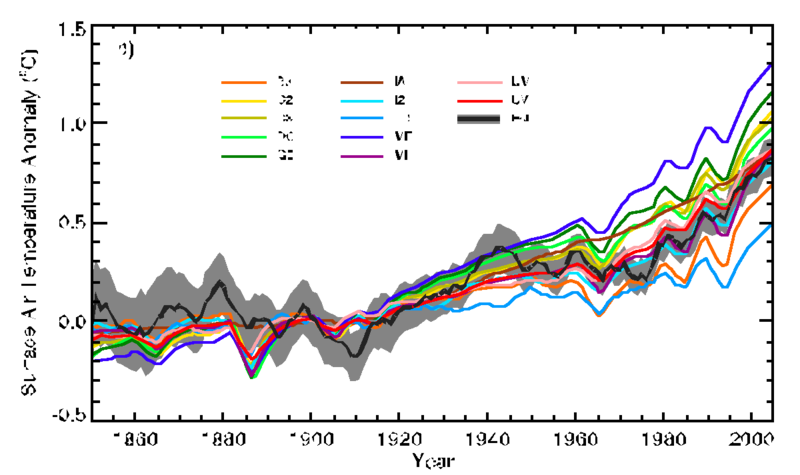 Predictions from twelve of the participating models are illustrated above, comparing simulated global warming with observations since preindustrial times. One significant conclusion of this inter-comparison project was that the uptake of CO2 by vegetation appeared to be underestimated by all contributing models. This conclusion was subsequently examined in some detail by the Palaeoenvironmental Change group, producing a study which helped to better quantify the strength of this important global sink. Experiments under controlled conditions have unambiguously demonstrated that photosynthesis is stimulated when atmospheric CO2 concentrations are increased. Although these studies help to quantify the strength of this CO2 fertilisation effect, extrapolating such estimates to the global scale is extremely difficult, especially since other nutrients such as nitrogen may be the locally limiting factor in nature. CO2 fertilisation is a very important process in the global carbon cycle as it acts as a negative feedback for anthropogenic CO2 emissions. Increased atmospheric CO2 stimulates photosynthesis so that some fraction of these emissions is taken up from the atmosphere by vegetation. Researchers in the Palaeoenvironmental Change group have derived a probabilistic estimate of the globally averaged strength of CO2 fertilisation that is independent of experimental evidence. Instead, we simply considered the changes in the global carbon budget since preindustrial times. 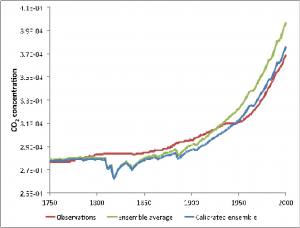 Historical changes in atmospheric CO2 concentrations are very accurately known. Historical fossil fuel emissions are relatively well known. Emissions from deforestation can be quantified, albeit with significant uncertainty. These historical emissions are partitioned between the atmosphere, the ocean and the terrestrial biosphere. With careful attention to the considerable uncertainties (evaluated by performing many hundreds of simulations of the Earth system model GENIE), the strength of CO2 fertilisation can be treated as the unknown quantity that balances the carbon budget. This figure summarizes the results of the calculation. Observed CO2 concentrations are plotted as the red line. 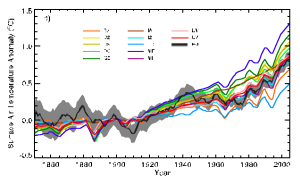 The green line plots the modeled prediction of CO2 when no knowledge is assumed about the strength of CO2 fertilisation, besides some plausible range of possible strengths. The red line plots the CO2 that is simulated after the calibration, and brings the present day simulated CO2 much closer to observations. This calibrated model is likely to provide more reliable projections of future CO2 concentrations and climate change. We estimate that the increase in gross primary productivity in response to a doubling of CO2 is very likely (90% confidence) to exceed 20%, with a most likely value of 40-60%. The most important caveat to this estimate is that GENIE does not represent all of the possible contributing mechanisms to the land sink. 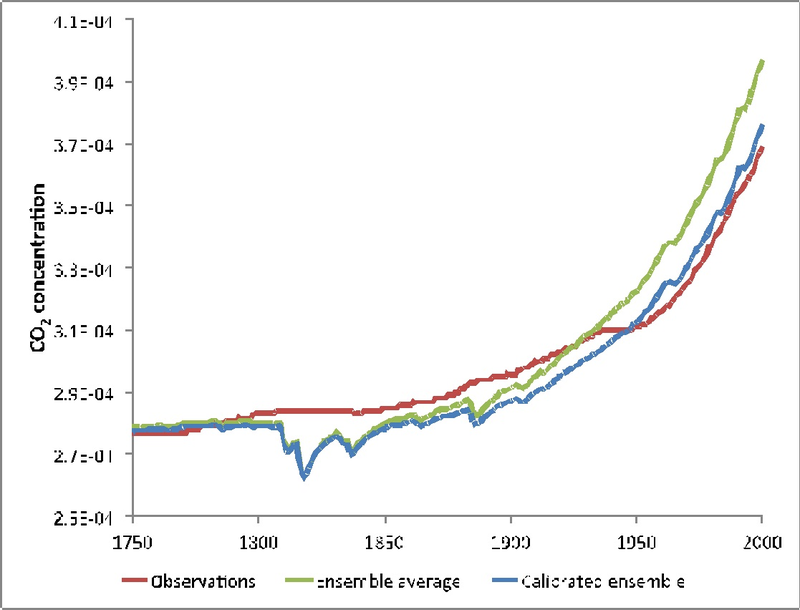 If these missing processes comprise a net sink, then our calibration of the strength of CO2 fertilisation represents an upper estimate.